I love warm comfort food and in winter after dinner I usually want something hearty, a little bit sweet, and healthy for dessert. 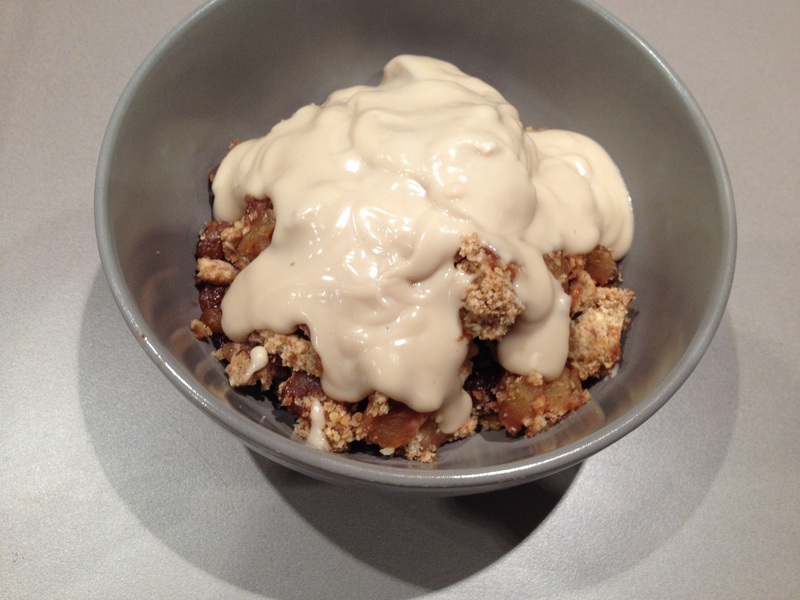 This recipe was concocted one evening when I realised I didn’t have anything to put on top of my apple crumble. Don’t get me wrong – you can eat it by itself and it’s delicious, but I like to have a custard, cream or ice-cream on top to add a bit of decadence. In my state of panic once I realised I had none of the above options, I decided to make a coconut milk custard (because I didn’t have any eggs, custard powder or milk to make a regular custard) to go with my dessert…and it was AMAZING!!! Super easy, can be made in the microwave – and best of all it’s delicious AND healthy…not to mention gluten and dairy free!! Mix apples, 1 tbsp sugar, water, 1 tsp cinnamon and sultanas in a microwave/oven safe dish (I do this whole crumble recipe in 1 dish to save on washing up later). Cover with lid and microwave on HIGH for 5 minutes. Meanwhile in a separate bowl rubflour and oil/butter together with your fingertips until you get the consistency of breadcrumbs. Add coconut, almonds and remaining sugar and cinnamon and mix to combine. Once apples are cooked sprinkle crumble mix on top and bake for 20 minutes or until top is golden brown and crunchy. Put can of coconut milk in freezer for half an hour (this separates the coconut water from the milk) and then tip the creamy milk into a bowl, leaving the watery part out. Add cornflour to water and mix until dissolved. Pour the flour/water mix into creamy coconut milk and add sweetener. Microwave on HIGH for 2-3 minutes (depending on the wattage of your microwave) stirring/whisking every 30-40 seconds. The mix should thicken and be the consistency of a pouring custard. Serve with apple crumble (or anything else that requires custard!) and enjoy! The finished product – so yum!